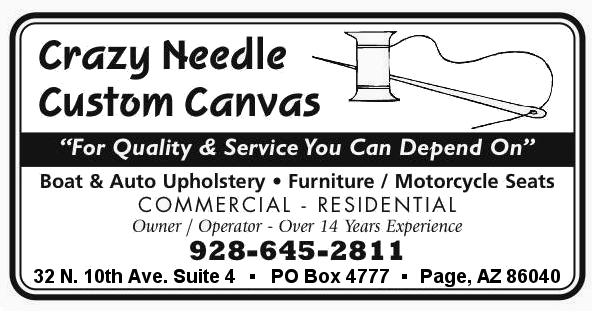 As Page, Arizona’s custom boat, auto, and furniture upholstery shop, Crazy Needle Custom Canvas is in high demand. This is the place to go if you need new boat, auto, or motorcycle seats, custom upholstery, screening, and boat canvas work. The hot sun and spring winds in the Page Lake Powell area can wreak havoc on boat and auto upholstery, and Crazy Needle is the place to get these things repaired. 32 N. 10th Ave. Suite 4. 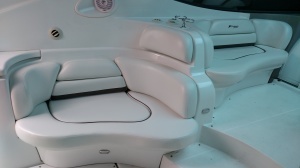 Crazy Needle provides commercial and residential boat upholstery, furniture, and motorcyle seats. They have been providing services to Page Lake Powell since 2000, They have been providing special canvas and upholstery for just about every houseboat and motor boat imaginable. 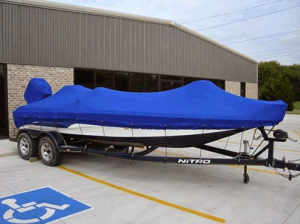 You will find the finest, custom boat covers here, folks.